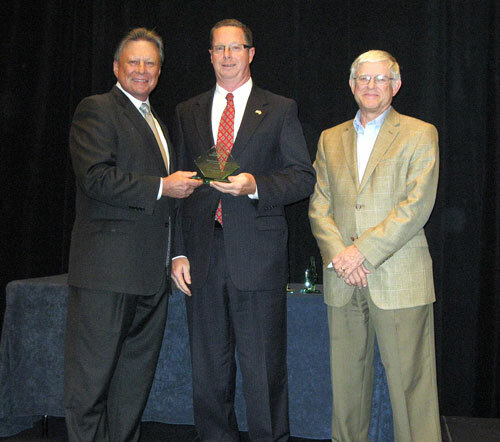 Left, Rich Kolodziej (left), president of NGVAmerica, and Doug Horne (right), president of Clean Vehicle Education Foundation, present the “NGV Public Policy Champion 2012” award to Pennsylvania state Rep. Stan Saylor for his efforts in the Pennsylvania Legislature to promote the use of clean and efficient natural gas vehicles. HARRISBURG – Rep. Stan Saylor (R-York) was recently honored for his efforts to boost Pennsylvania’s economy and improving air quality by encouraging businesses to convert their diesel and gasoline vehicle fleets into clean-burning natural gas vehicles (NGVs) by NGVAmerica and the Clean Vehicle Education Foundation (CVEF). NGVAmerica and the CVEF are organizations dedicated to increasing the use of natural gas-powered vehicles to improve air quality, lessen dependence on foreign oil and reduce fleet operator costs. In Chicago on Oct. 5, they honored the 2012 winners of the prestigious NGV Achievement Award. The awards, 10 of them, are given to persons and organizations in recognition of their outstanding contributions in leadership, vision and innovation to the advancement of natural gas as a vehicular fuel. Saylor garnered the organizations’ “NGV Public Policy Champion” award for “showing great leadership by generating tremendous NGV momentum in the Pennsylvania General Assembly.” Saylor’s outreach to other House members about the benefits of natural gas, as well as the huge opportunity the Marcellus Shale resource plays to move the Commonwealth toward energy independence, were the factors that led to his selection. In particular, the “Marcellus Works” package of legislation designed to secure Pennsylvania’s energy future and create thousands of new jobs by creating incentives for the use of clean natural gas, and Act 13 impact fee law – strongly supported by Saylor – will provide $20 million in grants through 2015 for initiatives that include the conversion of vehicles to natural gas. Saylor noted that fueling a vehicle with natural gas instead of gasoline costs about $2.50 on a gallon-equivalent basis and that using the fuel boosts the American economy.